Obiyo brings the right combination of energy, experience, and execution to drive the mission forward. Chicago, IL, April 02, 2019 --(PR.com)-- ClariLegal, a revolutionary vendor RFP and management platform for legal services, is pleased to announce the appointment of Chuki Obiyo as Chief Client Officer. 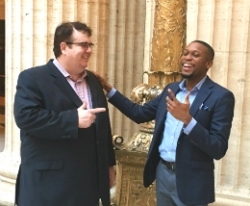 In his new role, Obiyo will work with ClariLegal Founder and CEO Cash Butler to improve business outcomes for corporate legal departments and law firms using the ClariLegal platform. Obiyo brings more than a decade of experience working directly with leaders at Fortune 500 companies and law firms to help them improve organizational performance and transform business operations. Prior to joining ClariLegal, Obiyo served as Director at Morae Global Corporation, where he helped corporate law departments improve operations by leveraging strategic staffing and technology solutions on-demand. Prior to that position, he led a business development initiative at LinkedIn Corporation which configured the LinkedIn Sales Navigator tool to support law department staff augmentation and law firm client acquisition strategies. Prior to working at LinkedIn Corporation, Obiyo worked at The Corporate Executive Board Company, where he consulted with senior executives to identify and implement best practices within their corporate functions. He is a graduate of Northwestern University Pritzker School of Law and The University of Texas at Austin. For more information on ClariLegal or to see the platform in action, visit www.ClariLegal.com. ClariLegal is an award-winning, cloud-based preferred vendor management platform for legal services that improves business outcomes while reducing overall costs. We match corporations and law firms with preferred vendors through a fast and complete RFP and bidding process. The platform benefits both the clients and the service providers. ClariLegal is privately held and headquartered in Ann Arbor, Michigan, and is powered by a network of advisors, developers, and contractors. For more information, visit ClariLegal.com or follow us on LinkedIn and Twitter.